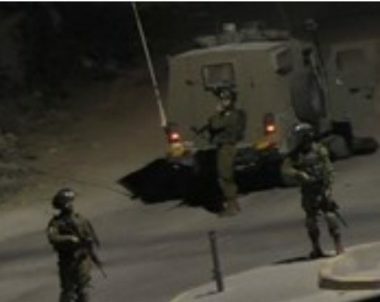 The Palestinian Prisoners’ Society (PPS) has reported that Israeli soldiers abducted, on Monday at dawn, at least eleven Palestinians from several parts of the occupied West Bank. The PPS sad the soldiers invaded and ransacked dozens of homes, and interrogated many Palestinians, before abducting at least eleven. Tamer Yasser Daghlas, 18, Burqa village, north of Nablus. Mustafa Ahmad Omar, 21, Burqa village, north of Nablus. Sa’id Mohammad Hajji, 25, Burqa village, north of Nablus. Maher Ata Salah, 24, Burqa village, north of Nablus. Ahmad Ismael Hamayel, 23, Beita town, south of Nablus. Jamal Sar’awi, Deheishe refugee camp, south of Bethlehem. Mohammad Abu Ayyash, Deheishe refugee camp, south of Bethlehem. Ismael Nidal Abu Sheikh, Qalqilia. It is worth mentioning that the soldiers also killed a Palestinian child, identified as Akram Tha’er Mizhir, 15, after shooting him with a live round in the chest, in the Deheishe refugee camp. In related news, the Palestinian Health Ministry in Gaza has reported, on Monday at dawn, that a young man, identified as Karam Ibrahim Arafat, 26, died from serious wounds he suffered, on June 8th, after Israeli soldiers shot him with live fire.